Simply put, we want to reward you for what you already do – enjoy all your favorites at Carbone's. 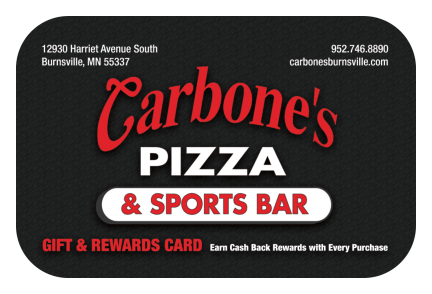 Carbone's Rewards is a completely FREE program for our customers to enjoy free kickbacks from Carbone's in Burnsville. Just sign up, present your card or give us your cell number every time you visit and we'll begin rewarding you with 10-25% cash back on your rewards card. Login to check balances, update your profile or view card activity.